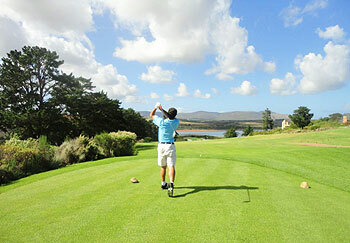 Arabella Golf Club is set dramatically on edge of the Bot River Lagoon. This wetland is home to thousands of waterfowl, so keep your eyes peeled for the Blue Crane… this beautiful bird is even the Arabella club emblem. The prolific architect Peter Matkovich laid out Arabella on what was originally stony farmland. There was plenty of clearing to be done, “ you could not even walk next to the lagoon,” said Matko. So, in 1998 after a fair amount of earth moving and felling of invasive trees, Arabella opened for play to a rapturous standing ovation. Arabella is in balance and naturally in tune. Each hole flows seamlessly and sits comfortably with the landscape The Bot River Lagoon certainly provides an unforgettable backdrop and the 8th hole, a magnificent par five, capitalises on the vista to a dramatic effect with the green seemingly cut into the lagoon itself. Arabella Golf Club held the Nelson Mandela Invitational for a number of years between 2000 and 2006, after which time the event was re-branded as the Gary Player Invitational, which Arabella continued to host until 2008. At 6,381 metres, Arabella was not the stiffest of tests for the top pros, but the charity event was rather special and the atmosphere was more like a carnival than a normal PGA tour event. Arabella leaves nothing to chance and this course really is in tune with nature. Even the long bunker, which runs along the edge of the 18th, is there to protect the Bot River Lagoon ecosystem. The sand is there to trap the chemical run-off so that the ponies and flamingos can go about the business in harmony with golf. “Listen to the land” is a wonderful design philosophy… thank you Matko. 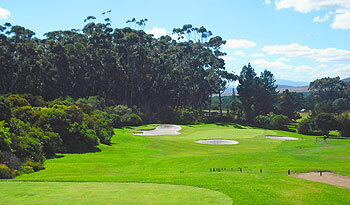 Probably it is one of the best golf courses in the Garden Route and TOP 10 in South Africa. I had played in the middle of January, condition of fields was perfect, especially greens and fairways. They have really 5 stars hotel with acceptable price and discount for residens to play golf. I was bit dissapointed regarding driving range. It is quite small and narow, also short (you may use max 5 iron). Golf cource is not very challenging excl few holes as more open to wind. The 9th hole and 18th hole is calling to do risky drive for birdie chance. My opinion it is typical resort course with nice views and pretty good condition, service and surroundings, but some holes I find borring to play. I think it is one of „must be played“ in Garden Route. Arabella is a quality parkland course set around a security gated housing estate and luxury hotel with many holes having views of the Bot River Lagoon. The 9th, 17th and 18th holes play alongside the lagoon and its waters are some of the courses many hazards. There are plenty of groundstaff so the course and surrounds are kept in very good nick and much of the rough could be 'garden beds' on other courses! As expected for a course of this quality, a round is relatively expensive for SA courses but really would be considered a bargain in other countries. There had been a significant amount of rain around before playing so the course was quite heavy, but it did little to detract from the wonderful layout and aesthetics of this golf estate. There was even another shower which blew over whilst playing the 16th and 17th, but then the clouds parted and we played the 18th in late afternoon sunshine. A birdie on the par 5 last capped off a really enjoyable round. This course is one of those where you can think back and feel satisfied that you've been tested, that you had opportunities to use different clubs and shots and that golf is a wonderful pastime. Recommended as an easy day trip from Cape Town. Having read positive reviews before playing Arabella, I was not left disappointed after the round. Course was in very good condition. A gentle start before you really need to knuckle down and concentrate otherwise your round could be over before the 7th. Course eases up a but around the mid way point, and if you are in the groove you could really attack the course. Would love to play it again. It is sheer pleasure to play Arabella: fast greens, course in an immaculate condition, great lay-out, spectacular views. The only weak point: the right side of hole 15 and 16 could be improved: a barbed wire fence isn't that great to look at. They should put some vegetation. Highly recommended. A highly ranked course in the country and rightly so; there are some places on the course that are as good as anywhere. This estate is in a great location right on the ‘Botrivier Lagoon’ and I know that surroundings do not make a golf course great but they can have a huge influence and that is obvious at Arabella. Very early in the round you are challenged by ‘The Arabella Turn’ - this is not the evening’s hotel entertainment but a run of three holes starting at the 3rd and is the course’s equivalent to an ‘Amen Corner’ or a ‘Bear Trap’. These holes are two par-4’s and a par-3 that are so challenging that if you can score gross par (11 shots) across these three, then you are awarded a complimentary-round voucher. The two holes to close out the front nine are outstanding; the 8th is a par-5 that all golfers will enjoy, downhill, out of bounds on the left, a long bunker that protects the final 100 yards of the hole on the left and a small green with lagoon all around. The 9th is a reachable par-4 but is the risk worth it? The line to reach the green is thwart with lagoon and sand danger, so the sensible play could be a mid-iron from the tee and maybe the same club to approach with – super design though. After the mandatory half-way stop the back-nine starts slowly but eventually explodes with some stunning holes towards the end. My only criticism is the SI-18 hole, the par-3 14th, it is a very straight forward hole, maybe adding to the solitary bunker could help? The last four holes are all placed around the perimeter of the property and are a joy to play, with the par-3 17th and the par-5 18th the very best – both have more sand and the lagoon to deal with and if you need two pars to win your match, all I say is ‘good luck’. Stay and play highly recommended. Arabella was part of a 10 day FAM Trip to South Africa last March and one of the most expected courses to visit, due to some reviews I have read and to that fantastic 8th hole. I can tell I was not disappointed, the course is excellent from beginning to end, mantained in pristine shape and very well designed. Every single hole was something special and the course is very challenging. I cannot find weak points on it, the views are fantastic with the pond and the sea in most of the holes and the hotel is simply perfect, a very recomendable spot to stay. I can say holes 3rd (a very tough and long par 4 with water on the left), 4th (strong dog leg to the right to a small green), 15-16th two great par 4s downhill looking to the ocean are great holes, but for sure 8-9-17-18 are the 4 best holes on the course. The 8th, Signature Hole, is a strong downhill par 5 were drive is not that tough and there is space, but second shot if you go for it has danger (water) on both sides and the path gest narrow and narrow when you get close to the green. The 9th is a reachable par 4 which I eagled (drove it towards 15 feet and made the putt), not a tough hole but very nice and were risk-reward is in a great balance, with views of the lake, the hotel and the ocean. The 17th is a very nice par 3, were you have to be accurate and 3 is a great score. And finally 18th, a great finishing hole where you can get a very good chance of birdie or score very high figures, you need to keep left of the fairway and be smart with the 2nd if you wish to have an easy approach. An overall great experience, mandatory to play if you go to South Africa (a mandatory trip I can say, great food, golf and people) and for sure a place you will want to go back. Simple fantastic - this like many SA courses is a estate course and there are a few long walks between tee and green but that is all that I can fault it for. The course itself was in excellent condition and a fine test of golf. The views on many of the holes were spectacular very worth while playing.One further tip if you play in the middle of the day and stay in Cape |Town take the coastal route back view to die for which just finished of an excellent day. Only thing is for me the Links at Fancourt is better ! Gosh, this golf course is good. I've played at most of the Open courses, Pebble Beach, Valderrama but Arabella is definitely in my top 5 courses for sheer fun. It has been a few years now since I played it. Fresh from an overnight flight from the UK we drove straight to the course and were greeted by a fantastic resort with great service. We picked up our caddies who had exactly the right attitude - unobtrusive and knowledgeable - and had a few putts on the practice green. It was one of those relatively rare things in a practice green - true to the course and not crazy undulating. The course is a real joy. The fairways were undulating but never anything but fair and the greens were incredibly good - fast, true and great to putt on. The course is in an area of real beauty. The lagoon comes into play on several holes and makes a great backdrop. Hard to pick favourite holes but the par 3 17th and long 18th on the side of the lagoon provide a fantastic finish. In some ways I'm not sure if I want to go back to Arabella. It has so many great memories that I am worried there may be some rose-tinted spectacles in play but hopefully I'll get the chance to find out one day soon! A very attractive course and a good test for all levels. We were lucky enough to have perfect weather when we played Arabella but I imagine it's a much stiffer test when the wind blows. Not a long course but you need to be accurate from the tee as quite a few of the fairways are tight. Some really interesting holes with lots of water and big white bunkers. The greens are quick! Definitely worth a visit if you're in the Cape. One of the most visually appealing courses I have ever played. Every hole has its own individual character and both nines conclude with truly spectacular stretches alongside the lagoon. The course is in excellent condition and the carts come equipped with GPS sat nav that provide yardages from anywhere on the course - very good fun. Highly recommended and well worth the (scenic) drive out of Cape Town.